Paper Monuments Project #015: Starting in the 1840s up to the Civil War Irish immigration to New Orleans was at a fever pitch. The wave of Irish immigrants, many of whom were women, coincided with an increase in demand for servants in middle-class households. Domestic servants were a permanent feature of middle class families in 19th century America. We tend to think of them as lacking agency over their daily lives and without power to shape their future. Yet, Irish immigrant women belie that image, as a closer examination of this group demonstrates. 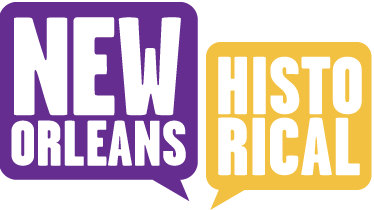 Starting in the 1840s up to the Civil War Irish immigration to New Orleans was at a fever pitch. Nearly two million people left Ireland in this period due to the Great Famine. The wave of Irish immigrants, many of whom were women, coincided with an increase in demand for servants in middle class households and resulted in plentiful and steady employment opportunities. No skill requirements and promises to train on the job attracted single Irish women to these jobs. They quickly realized that the market was expanding and that specialization within this field, such as training as a parlor maid versus a general servant, would empower them to sell their skilled labor and thereby increase their earning potential. Servants’ favorable bargaining position also was used to enable the women to practice their faith. Attending Mass and participating in important rituals was of paramount importance to most Irish immigrants. As Wharton loudly complains again: “Went to market at 6 ½ and for the first time in my life carried the basket myself as it is Easter Sunday and my Cook, being an Irish Catholic must of course be permitted to attend the early services of ‘ill mumbled mass,’ muttered by stupid Priests in equally stupid monkish Latin”. Additionally, since room and board were provided, domestics could save a large part of their earnings. They used this surplus in a variety of ways, including sending money home to Ireland. Indeed, Irish daughters reliably sent more remittances than sons and thus provided a lifeline that enabled other family members to leave. Beyond remittances, Irish immigrant women’s earnings also provided money for their families, their church, and their own financial security with remarkable success. 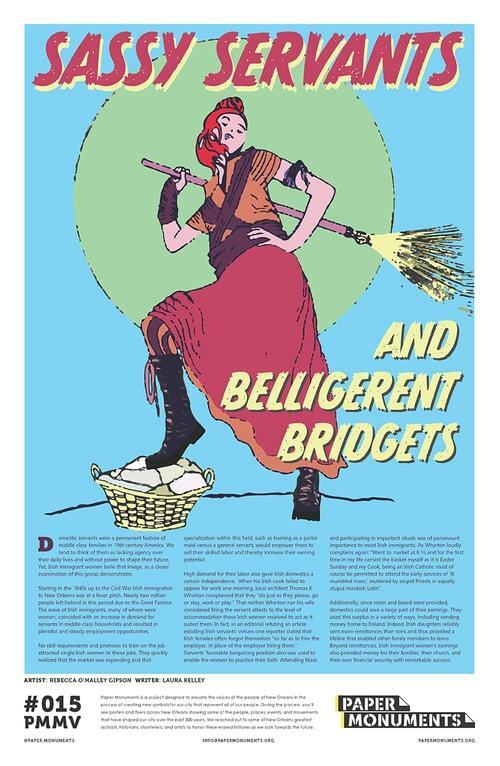 Paper Monuments, Laura D Kelley Ph.D., narrative , and Rebecca O'Malley Gipson, artwork, “Sassy Servants and Belligerent Bridgets: Irish Domestic Workers in the 19th Century,” New Orleans Historical, accessed April 19, 2019, https://neworleanshistorical.org/items/show/1430.